Two of my favorite blogging brides are getting married today. Here's to Christine & Mas and Kristina & Brock. I wish you indescribable joy. I'm so excited that these lovely ladies are getting married today. And what happened to double weddings? They look so much fun. 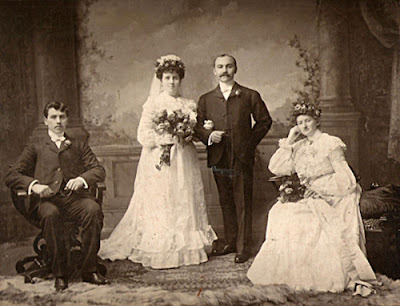 Although the girlie on the right looks less than thrilled with the whole wedding thing. It might actually be the least joyful wedding photo ever. I'm kind of enjoying the juxtaposition.